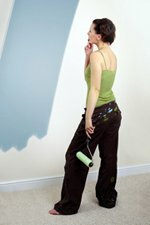 Painting over oil based paint can be done with all kinds of paint, but you might need to do a primer coat first. Painting latex over oil paint directly is not a good idea (it won't hold), but a shellac primer or sealer makes it hold. For acrylics, use an oil-based or acrylic primer. Old paint can be tested with pure alcohol. Put some alcohol on a cloth, and rub in inconspicuous spot. 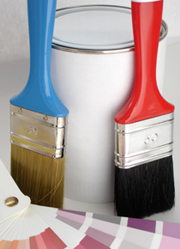 If paint comes off, it's latex or acrylic paint - if not, it's oil-based. 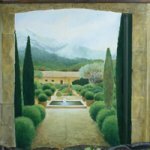 Painting latex over oils can't be done directly (it will chip off), but a shellac sealer or primer firmly sticks to the oil paint. The shellac dries in an hour, and then a latex paint can be applied over the shellac. Zinsser-BIN shellac primer/sealer (view and order here) is a good (white) shellac primer, and there's also a transparant shellac (Zinsser BIN sealer, view and order here)) if you want to keep the underground color. 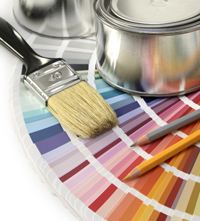 Click here for tips on underlying paint colors). Before doing the primer/sealer, first do some thorough painting preparation - sanding, cleaning and surface restoration. Latex paint has some filling capacity, but it will look better on a neat surface. After the shellac primer dried (an hour or so! ), you can apply the latex. And this is a fast drier too. So, painting latex over oil paint is not a time-consuming job. For painting over oil-based paint with acrylic paint, Zinsser oil-based cover-stain is the best product. Acrylics don't go well over shellac, but it will hold on an oil-based primer. Latex needs a few days to harden out and gain it's full strength - untill then, it will be tender and easily damaged. 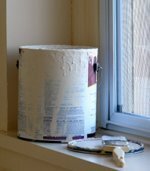 After painting latex over oil paint, you might consider giving the latex an extra coat of protection. When you wall or the objects you painted with latex will be used frequently: consider giving them a polyurethane laquer. This is one of the toughest paints around. When applying a protective laquer, it's best to wait a few days, and first let the latex harden out. Painting over oil based paint can be done directly with acrylics, but I've seen it only hold for about five years (unless recently acrylics have drastically improved). 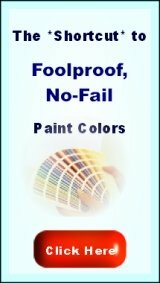 Paint manufacturors are working on it - Benjamin Moore even claims to have solved this problem and made a really durable acrylic housepaint. But not long ago, acrylics would start to peel after about five years. Just to be sure (and maybe also to neutralize the color), it's better to use an oil based primer bevore painting it over with acrylics. 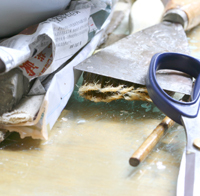 For painting latex over oil paint, you need to use a shellac primer or sealer. First the surface needs to be cleaned and sanded, the usual interior painting preparations. Is the oil surface still looking good? Then some fine sanding will do - use some fine abrasive paper (or Brillo pads) untill the shine is gone. If you will be painting latex over oil paint, then use the shellac primer or sealer. 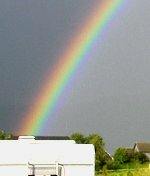 Shellac can be painted over with either latex or oil-based paint. So, if you want to use acrylic house paint, don't do the shellac primer. For that, take a normal primer - oil-based, if you can get it. An oil based primer is better for acrylics, but they have become hard to get. This is also how you can paint over laminate: a little sanding, a layer of shellac and then latex (or oil-based paint). 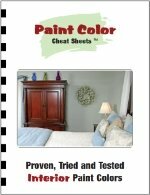 Painting shellac - primer or sealer? Shellac is available as a transparant coat, and as a hiding white primer. The transparant stuff is called "sealer" (Zinsser BIN), this stuff is also good for blocking stains and even odors. A shellac primer is white and hiding. Shellac needs to be worked with fast. It dries so quick, that the first bit you did can be dry before you end your painting job. Try to always keep a "wet seam" to your painting job, to avoid a patchy look. You can do this, by starting in a corner, and going back and forth along the seam of your job. It's a bit like wiping a window clean, without missing spots - working swiftly to avoid stripes of water drying up. The shellac itself is harmless and natural material, but its solvents are pretty agressive - pure shellac can only be solved in pure alcohol or thinner. During the job, it's good to have the windows open. Also a good idea: disposable brushes or sponge-brushes. It's a bit dirty job, but once dry, Shellac is considered safe for children's toys and furniture. Once dry, it's more healthy than acrylic paint. Still, if you're looking for less VOC and the same adherence: Kilz original primer was developed as an alternative to shellac primers, with the same adhering qualities. 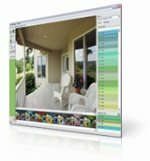 Click on the links to order your paints.